Release Message: Samurai Jack fights to save a village from a horrible fate. Featuring John DiMaggio as The Scotsman. Description: The Scotsman, now elderly and wheelchair-bound, leads an attack on Aku's tower. Aku easily obliterates two of the three assembled armies. The Scotsman stalls Aku to allow his army, consisting of his daughters, to retreat. 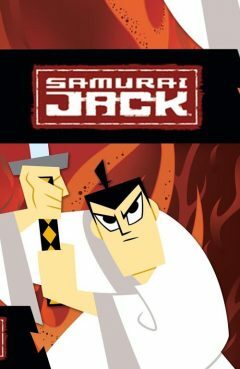 He is killed, but returns to life as a specter, and instructs his daughters to regroup, find Jack and destroy Aku. Elsewhere, Ashi has a troubling vision of the High Priestess, who is disgusted and disappointed at Ashi's insubordination. Ashi asks Jack to prove his claims of Aku's evil nature. They journey to several places destroyed by Aku, and eventually come upon a razed village whose children are forced to attack them through a mind-control device. As Ashi destroys the mind-control device, Jack is horrified to see the children collapse, believing them to be dead. The mysterious figure on horseback appears, and Jack willingly follows the figure into the fog. Ashi arrives as the children start coming to, and finds that Jack is gone.